As you celebrate and rejoice on this occasion of the commemoration of the bicentenary of the Serampore College and centenary of the Senate of Serampore, the CCA joins with the leadership of the Senate of Serampore to thank God for His abundant mercies and blessings. The legacy and contribution of the Serampore College and the Senate of Serampore (University) over the past two centuries in nurturing theological education and ecumenical formation are unparalleled in Asia. 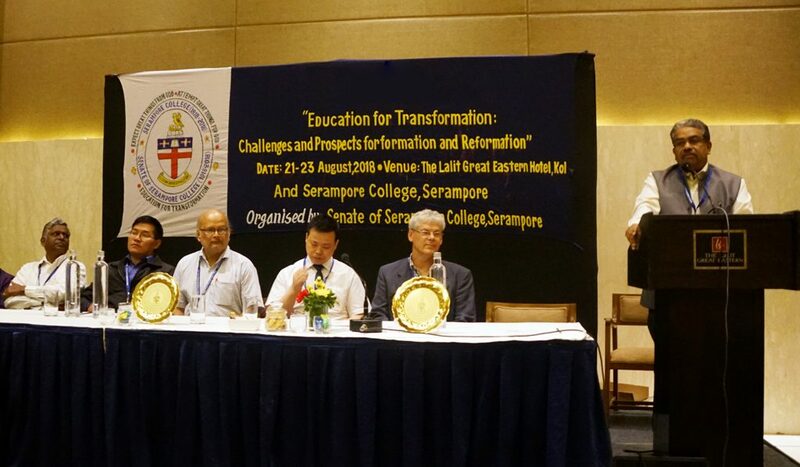 During the past six decades, the CCA and its forerunner EACC closely collaborated with Senate of Serampore in strengthening theological education in Asia. CCA was instrumental in developing the idea of strengthening Asian theology and theological education with Asian emphasis at the 1965 Kandy (Sri Lanka) Conference, which was organised by CCA on the theme, ‘The Task of Theology in Asia’. CCA General Secretaries D.T. Niles of Sri Lanka and U Kyaw Than of Burma were keen to promote theological education in Asia rather than sending students from Asian churches to the Western countries. In 1950s, 1960s and 1970s, CCA had initiated scholarships for students from various Asian countries to study in Indian theological institutions. In a situation where adequate freedom and space to initiate courageous and creative theological thinking is still lacking in many Asian churches, Asian theological education and institutions must take a lead in initiating new ways to nurture authentic Asian theological thinking that is more real to the life and witness of Churches. We cannot negate the fact that the theological education in Asia has by and large gained ascendency and legitimacy as predominantly Western. There is a clear void in ensuring unique Asian or Indian theological identity. Churches, theological institutions and theological educators in Asia still look for Western theological models. Asian theologians and educators prefer to pursue their advanced theological education in the West and yet, they use rhetoric to prove their distaste to the theology of the West. Advanced theological education in the West once again colonises the minds of many Asian theologians but they are often tempted to use certain anti-West rhetoric to prove that they are authentic Asian theologians, which is not a good taste at all! What Asia and Asian churches need today is a theology that reinforces mutual solidarity within Asia, which can assert real Asian identity, sense of belonging and ownership at all levels. Theology and theological education that help to develop creative and innovative theological insights out of the Asian experiences only would gain legitimacy as a predominantly Asian theology in a pluralistic Asian context. Young and budding theologians and Church leaders in Asia need to be encouraged and equipped to break the silence as and when they are expected to speak out on critical issues. The celebration of the centenary of the Senate of Serampore is also an occasion to reflect on questions such as how long Indian theological educational institutions and Indian theology can continue to be on the orbits of paternalistic Western models of theological thinking in Asia. The leadership of the Senate of Serampore should take initiatives to extend theological education facilities and the rich theological resources in India to share with other Asian churches that continue to lag behind in developing proper theological education facilities. The centenary celebration of the Senate of Serampore is an occasion to reflect further about the future role and direction of the Senate to look beyond the borders of India and extend the facilities and opportunities to other parts of Asia. Address by the General Secretary of the Christian Conference of Asia on the occasion marking the centenary of the 1915 Armenian Genocide, organized by the Holy See of Cilicia, Lebanon on 18 July 2015. The Armenian Genocide otherwise known as the Armenian Holocaust, the Armenian Massacres and, traditionally by Armenians, as Medz Yeghern (“Great Crime”), was the Ottoman government’s systematic extermination of its minority Armenian subjects inside their historic homeland. The total number of people killed as a result has been estimated at between 800,000 to 1.5 million. The starting date is conventionally held to be 24 April 1915, the day Ottoman authorities rounded up and arrested, subsequently executing, some 250 Armenian intellectuals and community leaders in Constantinople. 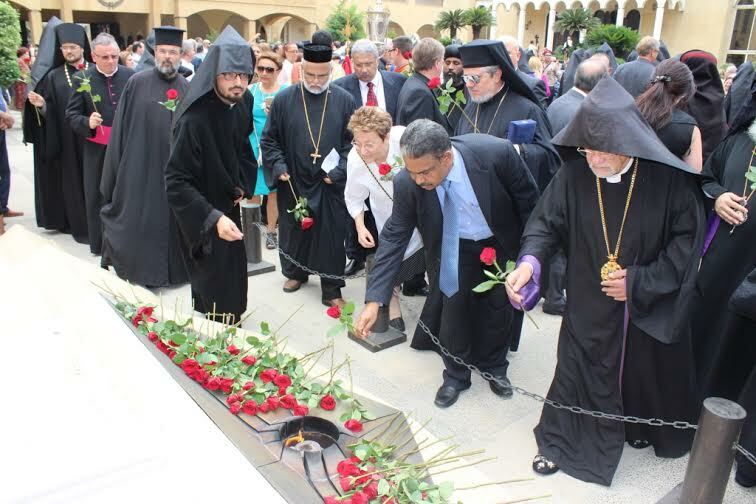 The centenary of the genocide was marked by a historic and unique event organized by the Armenian Apostolic Church of the Holy See of Cilicia, on 18 July 2015 at Beirut, Lebanon, to commemorate the martyrs of the Armenian genocide. Dr. Mathews George Chunakara represented CCA on this solemn and historic occasion. Please see the message delivered by him. Address by the General Secretary of the Christian Conference of Asia on the occasion marking the centenary of the 1915 Armenian Genocide, organised by the Holy See of Cilicia, Lebanon on 18 July 2015.